New software from Xsigo Systems is designed to link all the servers in a data center virtually, allowing IT managers to reconfigure virtual machines and other resources without carrying out traditional networking tasks. The Xsigo Server Fabric extends the company's technology beyond individual racks of servers by allowing its Xsigo I/O Director devices to connect to each other directly without going over a traditional LAN. That means, for example, that adding a new virtual machine (VM) doesn't involve using up an IP address or setting up a virtual LAN. The company said its goal is to virtualize the networking component of data centers, the last piece that has not been virtualized after computing and storage. As with other forms of virtualization, this should provide greater flexibility and easier management and scaling than in traditional computing centers, according to Xsigo. Essentially, the Xsigo Server Fabric creates a new infrastructure on top of the regular network, said Yankee Group analyst Zeus Kerravala. Like new data-center fabrics from traditional networking vendors, such as QFabric from Juniper Networks, it lets all servers and virtual machines talk directly to one another. But instead of using the network, Xsigo is doing this in the computing infrastructure, he said. The Server Fabric is a software complement to Xsigo's devices. Xsigo's I/O Director eliminated the access layer of a network, where servers connect to a switch. The Server Fabric goes beyond that to also eliminate the aggregation layer, where multiple switches are linked through another switch, said Jon Toor, vice president of marketing. The Xsigo infrastructure, in turn, is linked to a conventional LAN core, and it is compatible with core products from Cisco Systems, Juniper and other vendors. Together, the Xsigo products turn a hierarchical network into a pool of bandwidth that can be used to connect the virtualized resources of the whole data center, he said. And the bandwidth is significant, allowing enterprises to create Ethernet and Fibre Channel connections at speeds as high as 40G bps (bits per second) to as many as 1,000 physical servers and set up as many as 64,000 virtual connections among virtual machines and other resources on the network. The addition of the Server Fabric software removes the constraint of having to use traditional network connections in the aggregation layer, said Aaron Branham, director of technology at cloud data-center provider Bluelock, which uses Xsigo and plans to adopt the Server Fabric. Connecting servers together through the Xsigo infrastructure saves money and boosts capacity at the same time, he said. "What this new software is doing is just unlocking more bandwidth within the Xsigo," Branham said. Bluelock provides cloud-based virtual data centers to enterprises from a data center in Indianapolis and has about 70 customers, some of which have 100 or more virtual machines running. 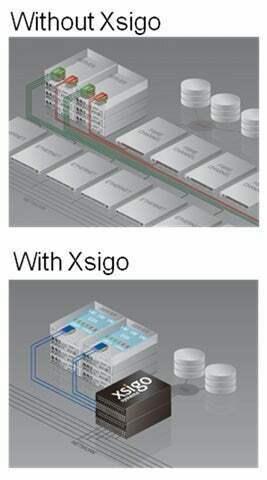 Even without the Server Fabric, Xsigo has already simplified the management of the data center, Branham said. Network engineers don't have to provision ports and carry out other steps when changes are made. "It's 'wire once' and then just maintain it remotely after that," Branham said. Provisioning a new physical server, from unboxing to operation, takes about an hour, Branham said. And even as Bluelock's servers get bigger, typically with 48 cores and 512G bytes of memory, running as many as 100 VMs, changing configurations in the data center is quick, he said. If a server needs to be shut down for maintenance, all the VMs can be moved to other physical servers in about seven minutes. Xsigo has a unique take on a problem that Cisco, Juniper and other big vendors are trying to solve: making networking more intelligent about virtualized computing, Yankee Group's Kerravala said. Ultimately, a conventional network might be able to scale to a larger size than Xsigo can, but Xsigo's approach should be easier for organizations to manage, he said. "It lets the virtualization manager continue to manage the computing infrastructure and lets the network manager manage the network infrastructure," Kerravala said. Because the problem of networks and virtualization is a recent one, there's room for Xsigo's approach in the industry, and it might someday be adopted by a major server vendor such as Dell or Hewlett-Packard, he said. "The market's wide open," Kerravala said. The Xsigo Server Fabric is made up of Xsigo's I/O Director, XMS Management Software and Fabric Extenders, along with a software upgrade called the SFS 1.0 Server Fabric Suite. The SFS 1.0 suite will be available starting in November, priced starting at US$35,000 for a single I/O Director license.